Welcome to the Michigan 2002 collection of field recordings. The gathering was held near the town of Bruce Crossing in the Ottawa National Forest. A few of my fondest memories are of the bullfrogs at Sucker Creek and the mud sculptures that several people carved into the mud that graced the ATV trail that was used as the main trail. 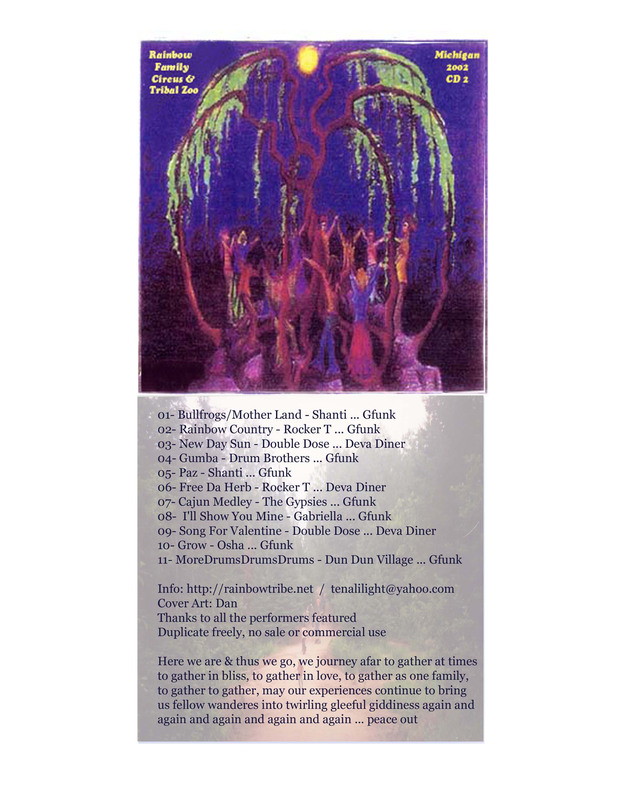 A sample of the frogs is featured at the beginning of the song Mother Land(track 1 CD 2) and a recording made while sitting by the sculptures called Buffalo Road can also be heard. This collection contains 2 CDs. Disk 1 has 12 tracks and Disk 2 has 11 tracks. Pass Freely, No Sale or Commercial Use.